Two life-size statues on the quayside -- one of a jaunty-tailed mermaid and one of a sailor in baggy trousers shading his eyes and gazing out to sea -- are the first things you'll spot as your tender noses its way into the harbor at Gythion. And their jolliness seems to encapsulate the spirit of the place. Stroll around Gythion, and this joie de vivre is evident everywhere -- in the higgledy-pigglediness of the pastel-tinted houses, which jumble their way up the foothills of Mount Koumaros, and the crooked whitewashed staircases that snake their way between them; in the purple bougainvillea climbing past shutters and tumbling over wrought-iron balconies brightly painted in nautical shades of deep blue and green; in the gaily checked tablecloths of the restaurants that line the waterfront; and in the vividly painted little fishing boats, each marked on the prow with an eye to avert evil, that bob about on the sparkling, inky-blue waters of the marina. If, like me, you hanker for the unspoiled Greece of 30 or 40 years ago, you'll find it there. Gythion looks like a quintessential Greek island of the 1970's -- except that it isn't. It's actually a small seaside town on the Mani Peninsula, which lies in the Southern Peloponnese and is the gateway to Sparta, the ancient Byzantine city of Mystras and the region of Laconia. In ancient times, the brusque and bellicose locals gave the world the word laconic. The residents are a lot more relaxed nowadays -- even though Gythion is a working town and is run-down in parts. 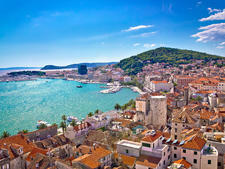 The pretty seafront and excellent fish restaurants there make the town an enjoyable and memorable port of call, particularly if you just want a relaxed day ashore that won't take you far from your ship. If you just want a sunny stroll ashore and a quick coffee -- or glass of wine and plate of calamari -- there are plenty of pretty little restaurants-with-a-view around the harbor. The main street is only a few minutes' walk from the tender drop-off. Hefty local taxes on restaurant meals can make an affordable lunch look a lot less so when the bill arrives. Checking one menu, I noted that VAT is 9 percent on soft drinks and 19 percent on alcoholic drinks; a 13 percent service charge and a 5 percent local tax are added on top of all that. So, if money's tight, look before you eat. Look out, too, for heavy traffic along the coast road. Narrow pavements and lines of parked cars mean you often have to walk into the road to get along, so watch your back. 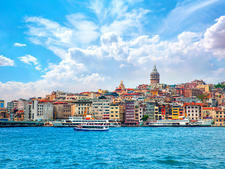 Head right from the harbor front, and you'll find taxis lined up between the small park and the Bank of Piraeus. Taxis are metered, but rates with waiting time are obviously subject to negotiation. I was quoted 80 to 100 euros for a roundtrip to Sparta and 100 to 120 euros to Mystras (each with about an hour's waiting time). The going metered rate is approximately 1.20 euros per kilometer, so the Caves of Diros (38 km away) should cost about 50 euros each way and Areopolis (26 km away on the west coast of Mani) about 32 euros each way. The taxi drivers were friendly and did their best to be helpful, so my advice would be to talk it through with them and agree on a fee in advance for the roundtrip plus waiting time. Most attractions in Gythion are within reasonable walking distance. The currency is the euro. See XE.com for the latest conversion rates. You'll find an ATM machine almost opposite the tender drop-off. Just head left around the small marina, and follow it around to the main shopping street; look across the road, and there's an ALPHA Bank ATM point right in front of you. 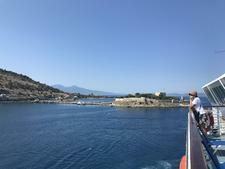 Alternatively, if you head right along the main promenade, you'll find two more outside the Bank of Piraeus and the National Bank, which are on the corner next to the small shady park on the right, about a five-minute walk away. Greek is the official language, and as this is not a mainstream tourist haunt, don't assume you'll find English-speakers easily. Take along a phrasebook if you really want to connect with the locals. You won't find English street names, either, so I've used landmarks for directions. Further confusion may be caused by the fact that various places around Gythion -- and the port itself -- have different names. 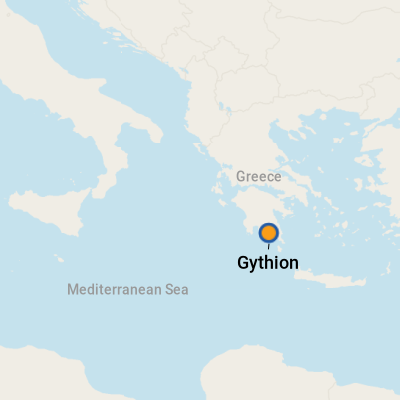 Gythion is also known as Gythio and can be spelled with a Y or an I; Mystras is also called Mistras or Mistra, and the little island linked to Gythion by a causeway (see Don't Miss) is variously known as Cranae, Kranai and Marathonisi. Decide to lunch in Gythion, and you'll be spoiled for choice; the seafront is lined with dining tables. The best way to find a lunch venue is simply to stroll about, check out some menus, and see what takes your fancy. While the local restaurants obviously major in that day's catch and deliciously crispy calamari, they also serve Greek classics like moussaka (aubergine, lamb and cheese bake), kleftiko (slowly braised lamb) and baklava (a sweet dessert made from phyllo pastry, spiced honey and nuts) -- washed down, of course, with pungent, thick Greek coffee. Best lunch with a view: Right on the harbor, overlooking the fishing boats one way and the sea wall the other, Navrinia serves up crisply battered calamari (squid rings); fried shrimp; Greek salads, enhanced with tasty tomatoes, olives and Feta cheese; and, of course, the local catch of the day. You'll spot it as you walk round the marina; look out for the washing lines hung with the unfortunate victims of that morning's trawl for squid. Best long-established eatery: The Saga Akpoiadi fish restaurant, which was founded in 1961, has a good name locally and lies on the coast road that runs left from the harbor to Cranae's causeway. It's also good for a sea view over to Cranae and its lighthouse. Best meze-style snacky meal: The little restaurant attached to La Boheme Hotel, also on the coast road, offers snacky little goodies like cheese and spinach pasties, zucchini balls, grilled feta, shrimp soup and salted pork from Mani for about 2.50 to 3 euros a portion. Like most restaurants in Gythion, it has tables set right next to the sea. Locals in the know also recommend the Ouzerie Korali in Gythion's main square (Platia Githeiou) for a shot of the famous Greek falling-down water and tasty mezedes (bite-sized Greek snacks similar to Spanish tapas). Best takeaway lunch: Stroll along the main street, and you'll find fragrant bakeries, serving cheese pasties and delicious custard and phyllo pastry tarts. The best souvenir has to be one of the beautiful Greek shadow theater puppets made by local artist Giorgios Hassanakos and displayed in his shop, which is on the main street facing the harbor, more or less opposite the tender station. (Go right from the harbor, and it's on the left, near the police station.) The puppets range in price and will look pretty fluttering in your windows or above a child's bed back home. The shop also sells attractive photographs of the island, taken by the elaborately bearded Giorgios, who is something of a local character. Taken in monochrome with one single splash of color -- the red of a geranium, the green of a bunch of grapes -- they're striking and affordable, at less than 100 euros with frame and less than 40 euros without.